Pack a picnic lunch for Garfield Park, don’t forget the kids, and be prepared to do some walking! A group of local businessmen purchased the original tract of 98 acres for the park in 1874. Hoping to establish a horse racing track, the group began development. After only a few years, the track failed, and the county sheriff was forced to seize the land due to failure to pay taxes. The City of Indianapolis bought the site shortly thereafter, making this park the first major land purchase in the local public parks movement. First named Southern Park, the park was renamed following the assassination of President Garfield in 1881. In the first decade of the 1900s, the newly constituted Board of Park Commissioners began to add acreage and permanent improvements to the park. Most notably, workers added a series of winding drives planned in the Victorian Romantic fashion. Two of the park’s graceful filled-spandrel concrete arch bridges date from 1907-08 and were part of this effort. Observation towers were a common feature of parks of the era. 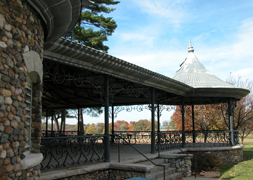 In 1903, the park board built the three-tiered pagoda for sightseers and picnickers. The structure is distinctive for its glacial bolder construction and flared roofline and still offers good views of downtown Indianapolis, some two miles due north. In 1912, George Edward Kessler prepared a master plan for Garfield Park, one of few local parks for which he created a full plan. Kessler hoped to retain most of the improvements made to that point. His main addition to the park was the sunken gardens. This highly formal, axial space contrasted with the naturalistic surroundings of Garfield Park and provided an additional focal point to the park and Kessler’s system. Restored in the 1990s, the sunken gardens feature spray fountains lit by colored lights and tan brick walks lining the planting beds. The lighting scheme was in place soon after construction of the fountains and provided night time entertainment for nearby residents for many years, as the lights do once again. The northwest corner of the park is a silent tribute to Marion County’s fallen World War I soldiers. Completed in 1920, the Memorial Grove, with its majestic trees, provides space for personal reflection. Garfield Park is located at 2450 S. Shelby St. on the south side of Indianapolis. Office phone is 317- 327-7221. As with all Indy parks, Garfield is open dawn to dusk. Facility hours vary seasonally. Activities available at Garfield Park include: bicycling, picnic shelters, walking/jogging paths, swimming, playgrounds, tennis, basketball (indoor). Seasonal activities at Garfield Park Conservatory and Sunken Gardens include the Poinsettia Show in mid-November to mid-December and a Spring Bulb Show in early April. INDYGO bus line from downtown: #22 Shelby, disembark at Shelby Street Branch Library adjacent to park.